Today the house is a warm and comfortable 21 degrees inside, 10 degrees outside. It’s like this whatever the temperature is outside. When people come to visit the house and ask us what’s it like in a Passivhaus, we ask them “You tell us – you’re sat in one – what does it feel like?”. You have to experience the comfort of a Passivhaus for yourselves to understand how different it feels from a standard building. It has an ever-so- comfortable environment that is steady and unchanging throughout the house. There are no draughts or uneven temperatures. In many ways it’s spoilt us for other houses. When we go away and have been in someone else’s house or a hotel we love to come back and walk back into this comfort again. We went away to a country cottage in Cornwall a couple of years ago. It had thick stone walls and was draughty and bitterly cold. We were feeding money into the electric fire and we were thinking ‘what are we doing?’. Moreover, not only is it an extremely comfortable and inspirational house to be in, it’s also a healthy house because the air is fresh and continually changing and is filtered by the MVHR ventilation system. We think that the PHPP software used to design Passivhaus buildings should stand for Passive House Performance Prediction (instead of Passive House Planning Package), because it is such an accurate predictor of building performance. We reckon that it costs us around £120 a year to heat and be comfortable in our house. Our gas bills are slightly more over the winter as it is also used for domestic hot water heating when the thermal hot water solar panels are not in operation. If you look at the cumulative effect over 5 years that’s £600 to have a comfortable home – people could be paying that for 6 months of heating bills! In our old house we were paying £1800 a year for all the energy bills. So for us over 5 years there’s been a massive saving and that’s only on the money side of it. There’s also the sustainability side of it – we’re using a fraction of the fossil fuels that we were using in our old house. The ‘NegaWatts’ or amount of energy that we haven’t needed over the last 5 years is significant…If you multiply that by all the Passivhaus buildings on stream, it is a significant saving in terms of not needing to burn so much fossil fuels. The MVHR system is working well and has been on 24/7 – the only time it goes off is when we change the filters. We change the filters twice a year and spend approximately £60 per year to replace them. So we have spent around £300 over the last 5 years to keep the MVHR system running smoothly and efficiently. In the early days when we first moved in we didn’t know how to run the house. It was a steep learning curve for everyone and it took us a while to work it all out. In the first 6 months there was a problem with the boiler ‘cycling’ (switching itself on an off) due to the small amount of water in the central heating system (as there were only 1 radiator and 2 towel rails to heat the whole house). The first winter was a very cold winter and we just turned up the heating and the house sometimes overheated up to 26 degrees in the upstairs rooms! Because of the ‘cycling’ and lack of control over the boiler we actually had to go to manual over-ride and turned it on and off at certain times. We were able to make a significant savings straight away. At the Golcar Passivhaus (another cavity wall Passivhaus being built by Green Building Store) they’ve actually used a thermal store/ buffer tank which means that there is a bigger volume of water so that there is no danger of the boiler ‘cycling’ in the same way. Andy Farr (Green Building Store’s MVHR Technical Manager) came to visit us early on at the house and monitored the air coming into the house from the MVHR systems, and found it to be non-existent! He checked how we’d been feeling and whether we were tired at all. We hadn’t noticed anything! He then noticed that a thin grille on the outside of the inlet duct was clogged up with seeds and leaves from the garden. He immediately removed the grille and the system worked fine. Suffice it to say, Green Building Store no longer use those grilles on its MVHR systems! It’s got to be said that because the house is based on a ‘fabric first’ approach and because most of the techy stuff has gone into the building itself (in term of insulation, airtightness, low cold bridging) there aren’t things that can go ‘wrong’ in the same way. The house runs itself. Whatever we do to it, the house runs along performing perfectly, hour after hour, day after day, year after year. If it’s built properly – which it is – you don’t have to do much to it and what we’ve had to tweak has been minor really. Much of Passivhaus design is subtle and under the radar – it’s not bling bling. We’re so used to Passivhaus now we don’t notice it – it’s the norm. We don’t have to think about it. It’s been and continues to be a fascinating and rewarding learning experience over the last five years. We are convinced that Passivhaus will continue to grow because it is a WIN WIN WIN situation. It wins on comfort, it wins on cost, it wins on sustainability. The blogs, films, training days and Passivhaus open days that we’ve been involved in with are all ways of rolling out more and more the good news story of Passivhaus. Every time a Passivhaus is built you get a mushrooming of expertise and a mushrooming of understanding and knowledge. 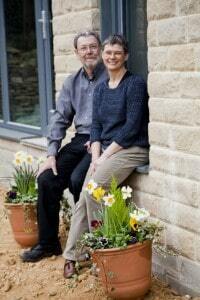 We have always said that we wanted to make the Denby Dale Passivhaus available to visitors as a resource. 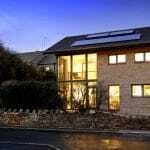 We’ve had at least 500 people through the house over the last few years at Passivhaus open days and other times. 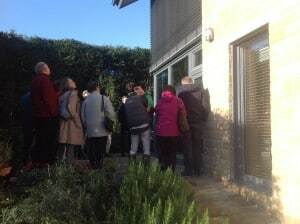 Visitors have included Shadow Ministers, US Passivhaus Designers, schoolchildren, university students, building apprentices, self-builders and co-housing enthusiasts, architects, builders, Kirklees councillors and local MPs. We like to hope that those visits have helped people on their Passivhaus journey, just as were we helped when we first visited Passivhaus homes in Austria. It is really important that people get to experience the comfort, warmth and air quality of Passivhaus buildings first hand to help spread the word. We have noticed changes in awareness of Passivhaus over the last 5 years. At first visitors used to ask ‘What is Passivhaus?’ but now we are noticing that more and more visitors already understand what Passivhaus is about, echoing a shift in awareness and understanding in the construction industry and amongst the general populace. Passivhaus wins constantly in addressing fuel poverty, comfort and energy efficiency. What really needs to happen is for Passivhaus to be used for social housing. All new housing should be Passivhaus but if you are going to prioritise anything it should be social housing. It is really annoying that this Government is promoting house building and a new crop of homes for first-time buyers but they’re talking about reducing the energy efficiency standards on them. They’re not future-proofing new houses. Energy is not going to come down in price in the foreseeable future. Passivhaus has a significant effect on the amount of energy you need. Rather than using energy, it is about making the most of the small energy that you need. One of our big challenges is getting Passivhaus supported in Government. Passivhaus is up against various vested interests. It could be argued that big energy companies have a vested interest in not wanting Passivhaus buildings because they don’t want less energy being used. Politicians won’t do anything about it unless there is a groundswell of people who want something to happen. 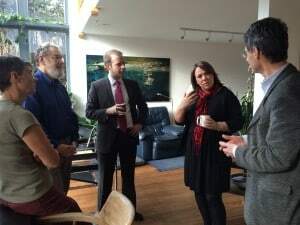 It was good to be visited recently by Jonathan Reynolds, the then Shadow Minister for Energy and Climate Change and Paula Sherriff, our new MP, who seemed genuinely interested in Passivhaus. A local Green Party councillor Andrew Cooper has been working on a policy to introduce Passivhaus as a requirement on any land sold by Kirklees council. Andrew has been one of our visitors here at Denby Dale and we’ve also met him subsequently, so we like to think that our home helped plant a seed for this. Politicians need to pick up the baton and run with it. We need to do this for humanity – we’ve got a finite earth and we’ve got to do what we can. If we do this, society wins, the people who live in it win, the housing stock wins and the planet wins. Thank you for your inspiration and encouragement to those of us who hope to follow in your footsteps with Passivhaus. It’s great to hear that after 5 years the benefits remain steady and reliable! Thanks for your write up on your beautyfull passivhouse. This says it all – in a gentle anecdotal tone relating the journey, including problems along the way, honestly for others to learn, . Only vested interest could explain the unpersuaded Passivhaus sceptic! Now in my own Passivhaus and approaching the PHT Open Days I will lean heavily on this text to draft my own explanations. ‘Feeling the Love’ Geoff and Kate! Thank you and to the team who helped you realise Denby Dale and for your continuing commitment to spreading ‘The Gospel according to Feist’. I’m not sure who will be reading this, but now it’s 21st February, 2017, so 16 months on from the last comments. I contacted Cllr Andrew Cooper about projects for social housing with Passive in mind, on Plane Street, Huddersfield 18 months ago and re-contacted him just recently as nothing had happened as far as I know. Passive House cavity wall, MHVR, triple glazing approach. Thanks for your interest in this. We are aware that Kirklees Council is exploring a Passivhaus policy for its own land but this has not yet been finalised. Hopefully this will come to fruition soon!